I have always said that to write a novel, or any significantly sized piece of writing, a writer must be willing to park himself down at his computer and write. There is no quick fix for writing. No easy button you can tap on your phone and make a high quality novel pop out. I still believe that. But that’s not to say mobile apps can’t help you in your quest to write a story, especially when you’re on the go and need a simple, orderly means of gathering together all those little plot bunnies that jump into your head at the worst possible moments. 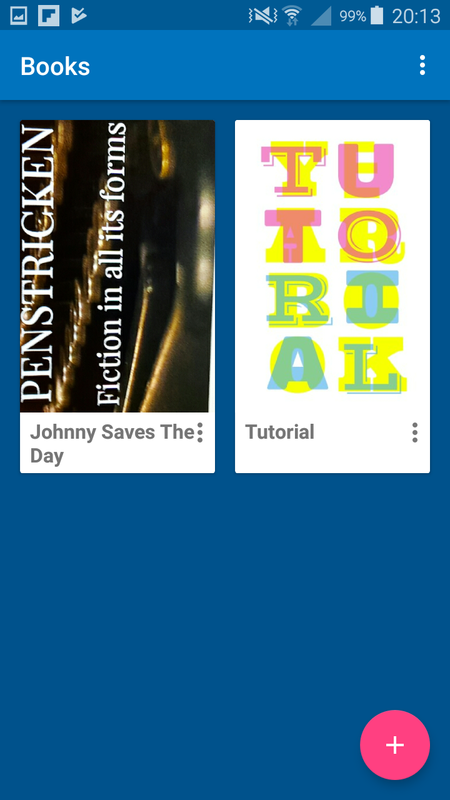 For that reason, I’ve been trying out a nice little app I discovered on Google Play called Novelist by Alessandro Riperi. Is it a good app? Yeah, I would say it is. It won’t make your breakfast for you and it certainly won’t make you the next John Steinbeck, but it has all the basic functionality needed to help you get you from a plot bunny to a complete chapter outline with little fuss. Let’s look at a few of its features. The first thing you will get when you open the app for the first time is a little spiel explaining how to use the app. After that, you go straight to the home page and — as far as I can tell — you never get the little introductory lecture again. The home page itself is a pretty self-explanatory window displaying all of your projects (which you can illustrate with an image from your device’s memory, if you’re that way inclined), including a pre-loaded ‘tutorial’ project which you can edit and tinker with to your heart’s content (don’t worry! If you make a total mess of the tutorial project, it’s easy to generate a new one from the menu on the home screen). Once you create a project, the app takes you through three stages: ‘plotting’, ‘outlining’ and ‘organising’, apparently with the idea that you work through these three stages in order. An example character profile using metadata. Under ‘plotting’, we have a space to create all those elements which are fundamental to story-writing: characters, locations (settings), themes, key events and so forth. These are referred to as ‘items’ in this app, which are easy to customise with a title, synopsis, text and images as you see fit. All of these items can be tagged, duplicated and shifted from one category to another. Best of all, each of these items comes with the option of including metadata, allowing you to quickly list all the vital details of your character, setting or theme. You can also add ‘notes’ and ‘text’ to each item, though I must admit I’m a little fuzzy on why these are separate features. Under the ‘planning’ tab, you are invited to organise your story into scenes. 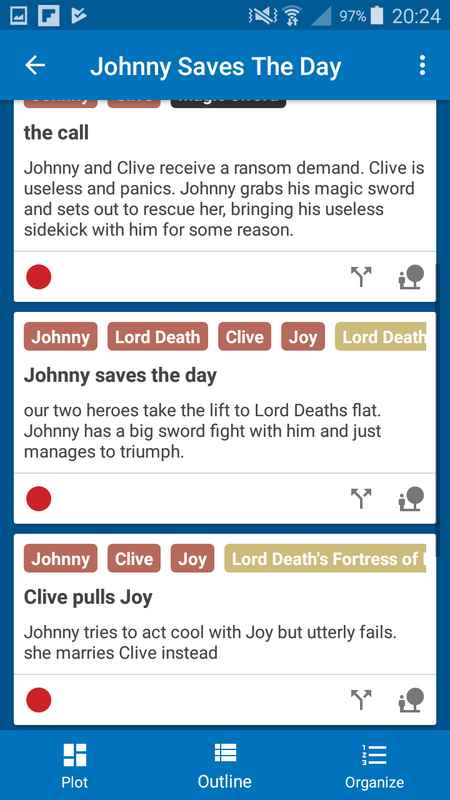 You create new scenes in a similar way to how you create items in the plotting section, with a title and a synopsis. As before, you have the ability to add text or notes to each scene, however you do not have the ability to add images or metadata. 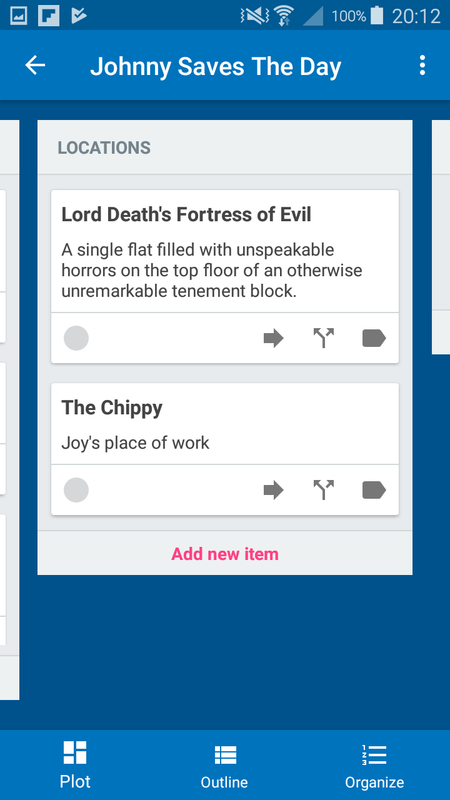 What you can do is tag your scenes with the items you created in the plotting stage; not a feature I personally find useful because that’s just not the way my brain works but I know it will suit plenty of other writers down to the ground. Finally, the ‘organising’ section allows you to organise the scenes you have created into chapters/sections as you see fit. The order of these scenes and sections can be easily jiggled about until you are happy that you have a full-blown chapter layout. The only real drawback here is that you can’t see any of the details about the scenes you created in this section apart from their titles and synopses. Apart from that, it makes it an absolute joy to organise and re-organise the order of your sections, chapters and scenes. There’s something else I love about this app: it’s free. Okay, I know that’s not technically a feature but still… it’s an actual, truly, honestly to goodness full version that’s absolutely free. Not ‘free, but hey, we’ve got a better version that’s not free’; not ‘free for the first thirty days’; not even ‘free as long as you tell us where you live and watch a bunch of ads’. In fact, I haven’t even seen any ads! It’s just FREE. I am so happy I could weep. In summery, if you’re looking for an app to write your manuscript on, this isn’t it. I don’t think it was ever meant to be used for that purpose. 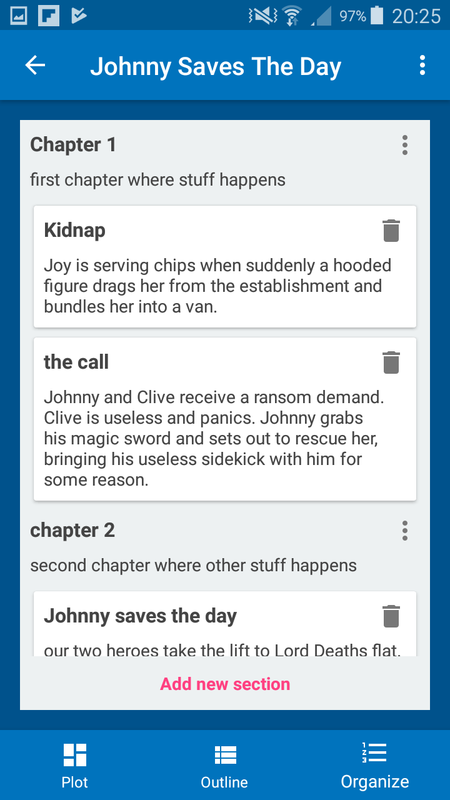 But if you own an Android device and are looking for a clean and simple way to develop an idea into a fully fledged chapter outline, including character profiles and all that other marvellous stuff that planners love so much, this app is definitely worth a look. It’s free, easy to use and covers all the story-planning essentials without forcing you to watch any pesky little ads. Go and get it! Thanks for taking the time to read this post. Be sure to leave us a wee comment if you enjoyed it and don’t forget to ‘like’ this post and follow us so you never miss another post. You can also follow Penstricken on Twitter and like Penstricken on Facebook, if that’s what outlines your novel. Last week, we talked about a few ways to get that initial spark of an idea when you’re starting a new story from scratch. This week, I want to talk about the really difficult bit: turning that crumby idea into a story. No matter how clever your crumby idea might be, it’s not a story yet. Stories never (well, almost never) just pop into the head fully formed. Even if you are planning on writing a piece of historical fiction and you know exactly whom and when you want to write about (for instance, the death of Christopher Marlowe), you still don’t have a fully formed story yet. You have an idea. A story must have structure to function. It is unlikely to pop into your head neatly structured, and even if it does, it is almost certain to be full of plot holes. Heck, it might not even be as fully formed as that. It might just be a single character, setting or theme you want to explore. Even historical events lack the kind of structure they need in order to make them work as stories, since real life is replete with random events, unresolved problems, and has no beginning and end (unless, of course, you’re writing a character’s entire life-story, but even then… you need structure to make it feel like it’s going somewhere). If you’re like me, you might find you need to polish an idea a thousand times over before it can truly function as a story. In all probability, your initial idea will be like a newborn; exciting, full of potential but ultimately, not able to do very much right at the moment. No one expects a newborn infant to perform brain surgery the day they’re born. They need to get big enough first, and at this stage, your story is a newborn. Exactly how you go about expanding your idea will vary somewhat depending on a) your preferred style of working and b) exactly what kind of idea you already have, but in general terms, it would be a good idea at this stage to develop your characters, your setting and the important events you want to happen. Personally, I would be inclined to start with characters, since characters are the driving force behind any good story. They want something and so, they all do something about it. That’s what makes a story happen. So even if your initial idea was a character, it’s still a good idea to get out your notepad and start fleshing out a few of the most important players in your story. At the very least, I would try to develop your main protagonist, antagonist, any important supporting characters and – depending on your story – perhaps a love-interest as well. At the very least, you should try to develop basic ‘demographic’ information for each character (i.e., name, age, gender, religion, date of birth, etc) and – most importantly of all – motivation and goals for your characters. Once you’ve got this, you will probably find a very natural sequence of events flows from the way the characters’ motives and actions interact and (best of all) conflict with one another. Johnny wants to take Jeannie to the dance. Jeannie wants Jimmy to take her to the dance. Jimmy hates dancing and isn’t too wild about Jeannie either. The result is that Johnny asks Jeannie to the dance, but Jeannie says no and tries to coax Jimmy into asking her instead, until it is finally revealed to her that Jimmy would rather eat his own foot so she accepts Johnny’s invitation after all and realises he’s actually a great guy. Thus, from our characters, flows our plot. From our plot, we can also begin to invent a few key settings. For example, is this ‘dance’ a school disco? A work night out? A charity ball? Where do these characters all know each other from? Do they frequent the same pubs? Do they ride the same bus? Do they work in the same office? All of these are potentially important settings. Jimmy and Jeannie both work in the same office and he fancies her rotten. Unfortunately, he has severe social anxiety and misses his chance to invite her to the office Christmas party. She ends up going with Johnny instead. Jimmy shows up at the party intending to talk to her, but ends up hyperventilating because of his social anxiety and is carried off in an ambulance. Johnny makes fun of Jimmy’s social anxiety and as a result, Jeannie realises what a horrible person Johnny is and decides to dump him for Jimmy. Great! We have structure! Of course, even now there is still much to do. Almost any plot you come up with (and yours will almost certainly be better than the example one I just used) will have a few issues that need sorting out. I find the best approach to removing any plot holes and generally smoothing all the rough edges is to write down the sequence of events as they are supposed to happen in as much detail as you can at this early stage and try to identify any obvious plot holes. The aim is, quite simply, to weed them out. Can they be fixed? How do the changes you have made affect the rest of the story? You may find that using this approach means writing and re-writing your outline over and over again but believe me, it will save you a lot of heartache in the long run when you come to actually write your manuscript. Obviously this has been a (by no means exhaustive) whistle-stop tour of the kinds of things you need to do to turn your idea into a story. All this talk of developing characters, plot outlines and what-not could quite easily have been a whole series of more detailed blog posts (and I would definitely encourage you to research these kinds of things in more detail for yourself), but hopefully this gives you a flavour of the kind of things you can do to get from your initial, crumby idea to having a story which can truly stand on its own two feet and is ready to be turned into a manuscript. The exact process you use will probably be unique to you, but believe me, having a process that works for you will make all the difference. There were once two brothers who lived in Glasgow, who both managed to get jobs in Edinburgh. This was not a problem, since they both held full UK drivers’ licences, which they had acquired at about the same time and they both owned the same make and model of car. The eldest brother was wise. He set his alarm early in the morning and as soon as he was in his car, he turned on the ignition and drove to work in plenty of time. He lost his job without ever setting a foot in Edinburgh. A common mistake amateur writers make is to believe that they cannot write a story unless an idea – or inspiration – comes to them heralded by a chorus of angels. Like the foolish brother, they have all the necessary equipment (in the writer’s case, a brain with an imagination) but do not realise that to get any benefit from it, they need to make the effort to turn on the engine/imagination themselves. Now, as we all know, turning on a car’s ignition doesn’t immediately take you where you want to go. It simply starts the engine, allowing for the possibility of motion. In the same way, igniting the imagination (to continue the metaphor) does not immediately give you a fully formed story. It just gives you the idea, allowing for the possibility of a story. Perhaps I’ll talk about turning your idea into a story next week, but this week, I want to focus on that all important first stage: going from having nothing to having something. Read history, the news or even mythology. Just think for a moment about how long humanity has been around for and how many different things happen all over the world at any given time. Wars, disasters, weddings, funerals, births, deaths, financial meltdowns, lottery winners, crime, charity and a million other events besides. As if that were not enough, most societies throughout history come with a catalogue of myths, legends and fables that you can also delve into. If something from history grabs your interest, you could write it as a piece of historical fiction or you can simply borrow a very small element of it to inspire a whole new story. If you’re into character driven stories like me, and have the patience to do so, I would particularly recommend trying to find old letters, journals, newspaper clippings (particularly advertisements and letters from readers) and other primary sources to draw on because these give a much richer flavour of what kind of people lived in the time and place you’re reading about and what mattered to them. Try using a resource especially designed to provoke creativity such as Oblique Strategies, Story Dice or even random title generators. If you ask the internet, you’ll quickly find that there are loads of tools out there like these, especially designed to help spark the imagination. Some are especially aimed at writers, some are not; some are very cryptic, some are very clear; some are very expensive, some are free. It can be trial and error finding the right tool(s) for you but they can be a wonderful resources to have when you find the right one for you. However, whether you’re the sort of person who likes cryptic prompts such as ‘change nothing and continue consistently’ (Oblique Strategies) or very precise ones such as ‘in 100 words or less, write a story that includes the following: a poet who always speaks in rhyme, a pill bottle, a luminous feather’ (Writer Unblocked) – or even pictures, like I used to inspire my 6 word stories, it is still ultimately down to you to come up with your own idea. See that you don’t fall into the trap of thinking any of these tools can tell you what to write. They cannot. Even very explicit prompts, such as the Writer Unblocked one I referred to, still leave it very much up to the writer to turn that prompt into a usable story idea. ‘Pantsting’, even if you’re more of a planner can also be a good place to start. If you’ve got nothing, then make up a person – any old person. You might even want to base him on a real person that you know well (though be very, very, very careful about doing this in your final story). Then just write and see where he takes you. Maybe he’s going to the chip shop but… is abducted by aliens. How does he escape? I dunno. Just make it up as you go along and edit nothing. It doesn’t matter if you hit a dead end or if you end up writing a really rubbish story, since this is simply the writer’s equivalent of doodling. What matters is that you keep making stuff up. Most of it will be chucked out but some of it might contain the golden nuggets of inspiration. I once ‘doodled’ a story about a guy who was in prison (in fact, he wasn’t even the main character of this particular ‘doodle’) and now, he’s the main antagonist of my novel and possibly one of the characters I’m the most proud of creating. This is, of course, only a small selection of things you can try. No doubt if you ask the internet, you’ll find dozens more. Perhaps you even invented a few techniques yourself that you absolutely swear by. Do let us know about anything which works for you in the comments below! Don’t you just love Scrivener? I certainly do. I was a little wary of spending money on another glorified word processor but years later, I still think Scrivener is the best thirty quid I’ve ever spent. However, simply having the right tools for the job does not an author, make. While Scrivener did provide the resources to easily research, plan and write my novel in an organised way, I was not getting the most out of it at first because I wasn’t bothering to do any proper planning. I was just writing mountains of narrative; something I could have done for free on OpenOffice. However, not to be deterred from my dream of finishing that novel, I (a natural ‘pantser’) decided that I had to become a ‘planner’ to take my writing to the next level. 1- Research everything I needed to know in order to write my story; history, science or even good old fashioned people watching. For fantasy stories, this stage would also include ‘researching’ everything I needed to know about my fantasy world (i.e., world building). No actual writing happens at this stage. 2- Plan the specifics of my story. This is when I plan out my plot and flesh out my characters. 3- Write a draft. Assuming the first two stages are complete, this should involve no plotting or research. I should already have the fully fledged story in my mind; it is now a simple(!) matter of bringing that story to life in pleasing language. This is where Scrivener came into its own. Useful though the pre-loaded templates on Scrivener were, I needed a template that would make it easy for me to remain focused on what I was supposed to be doing at each stage. Fortunately, it’s a doddle to make your own templates on Scrivener, so that’s exactly what I did; one based on the above structure. I began by creating a blank Scrivener project. By default, a blank project on Scrivener still includes three folders: ‘Draft’, ‘Research’ and ‘Trash’. I added two more, which I labelled ‘The Old Drawing Board’ and ‘Stage 2 – Plan’. I also renamed the ‘Research’ folder as ‘Stage 1 – Research’ and the ‘Draft’ folder ‘Stage 3 – Draft’ and shuffled them into numerical order. These would form the basis for my ‘born again planner’ approach to writing. Initial Idea(s) – a small document in which I keep all the little flights of fancy I have which will eventually give rise to an actual story. I began by writing down my first idea in here, but quickly realised that I would need to keep coming back to it whenever a new idea occurred that might tempt me to skip research or planning. Timetable – This document consists of a table recording what I intend to do each day and what I actually accomplished. This helped me to stay focused on whatever task I had set myself for that day because it provided me with realistic goals that could be achieved each day. It was also rewarding to see evidence that my work was heading in some direction. The only difficulty I had with this approach, as a natural ‘pantser’, was deciding in advance what I would need to do each day. Jotter – I used this document to scribble down any notes I wanted to write to myself (all headed and dated, so I could keep track of them); plot ideas, character auditions and whatever other odds and ends came to mind at inappropriate times. I also found it useful to begin work every day by setting aside twenty-five minutes to write anything that came to mind. It got the urge to ‘pants’ out of my system and allowed me to focus on what I was supposed to be doing that day. Anything that I needed to know to help me write my story went in here. Anticipating the likelihood that I would have to research a variety of subjects, I divided my research folder into several sub-folders that I was likely to need: ‘Religions/Philosophies’, ‘Historical Events’, ‘Locations’, etc. In most cases, these folders would contain documents, images and webpages of relevant factual information. However, the novel I was working on at the time was a fantasy novel. This meant that research and world-building went hand in hand. I decided, therefore, that for fantasy stories, I would have a ‘Factual’ sub-folder, in which I would keep all the factual information that inspired my fantasy world but the other sub-folders would be used to hold all the ‘research’ about how my fantasy world worked. This allowed me to keep all my factual research and world building separate yet together. There were two related goals that I wanted to realise in the planning stage: plotting and creating characters. It was natural, therefore, to divide this folder into two sub-folders for characters and plot respectively. The plotting folder contains a variety of self-explanatory documents such as ‘synopsis’, ‘timeline’ (doubly-essential in my story, since I’m using a fantasy calendar) and a chapter-by-chapter outline of events that occur in my story. The character sub-folder is more complicated. It contains a further two sub-folders for the ‘Good Guys’ and ‘Bad Guys’, as well as an individual document which deals with how each of the characters relates to one another. The ‘Good Guys’ and ‘Bad Guys’ folders work the same way. Each one contains a profile of every character in the story (names, ages, etc.). Thanks to the magic of Scrivener, these profiles also double-up as ‘folders’, which contain a variety of other folders and documents such as ‘auditions‘ (short bursts of narrative which I write to flesh my characters out) and ‘gallery’ (a fairly self-explanatory folder of images). This allows me to produce a large amount of information about each character while keeping them all separate and orderly. The aforementioned ‘Relationships’ document is not attached to any one character. Instead, it is a single document which I use to map out in a few sentences how each character relates to all the other characters in the story. Last but not least, we have the drafting stage. I don’t have very much to say about this section which won’t be painfully obvious to you, especially if you use Scrivener yourself. I have left the drafting folder exactly the way Scrivener gave it to us: each folder is a chapter, each document within that folder is a single scene. Scrivener even formats each document for us into a suitable manuscript format, so there was very little in the way of customisation required here. All I needed was the discipline not to touch this folder until I had finished my research and planning. And there you have it! A simple three-staged approach to planning for ‘pansters’ made easy by Scrivener, Literature and Latte‘s glorious contribution to the world of writing.